So Christmas is over and now that the gifts have been opened, I can finally update everyone on what I was up to the last 2 months. 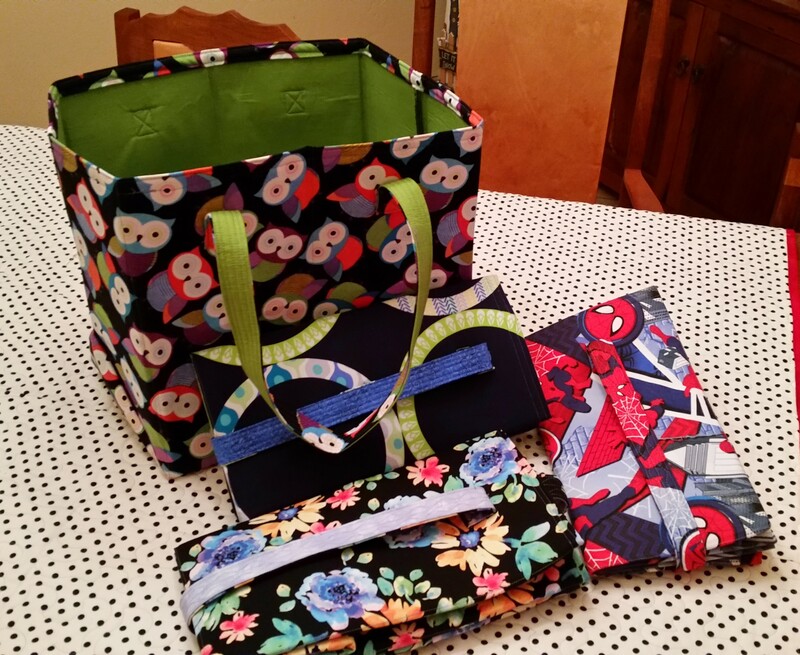 Grocery Bags: I love the Stand ‘n Stow pattern by Atkinson Designs. I first made this bag about a year ago and promptly left it somewhere. The secret to this bag, in my opinion, is the use of Pellon’s Peltex 71F stabilizer. This gives the bag shape and allows it to stand upright, like the paper grocery bags of my youth. Plus they fold flat so they are easy to store. I keep mine in the back seat of my car. The large one holds gallon milk bottles and tons (ok maybe not actual tons, but a lot) of groceries. I either want straps that are long enough to be shoulder straps or short enough to carry without the bag dragging on the ground. I made the straps 27″. This measurement is perfect for me. The added plus at this length, is that you can wrap the straps around the bottom of the bag to hold it closed for storing. There is still enough length to carry the bag when it is full. 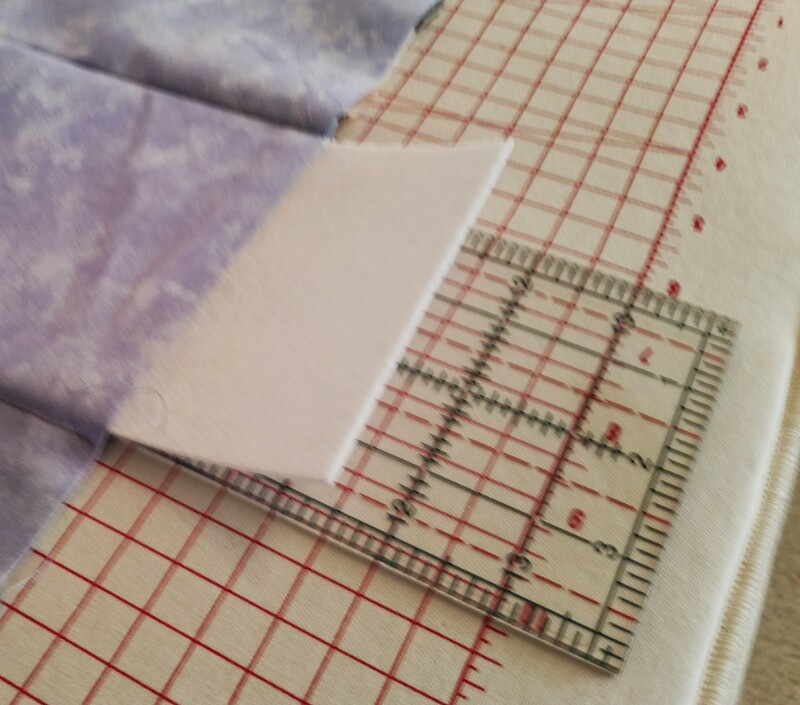 I found inserting the peltex to be easier if I put a ruler in the fabric opening to slide the stabilizer on. This really sped up that step. 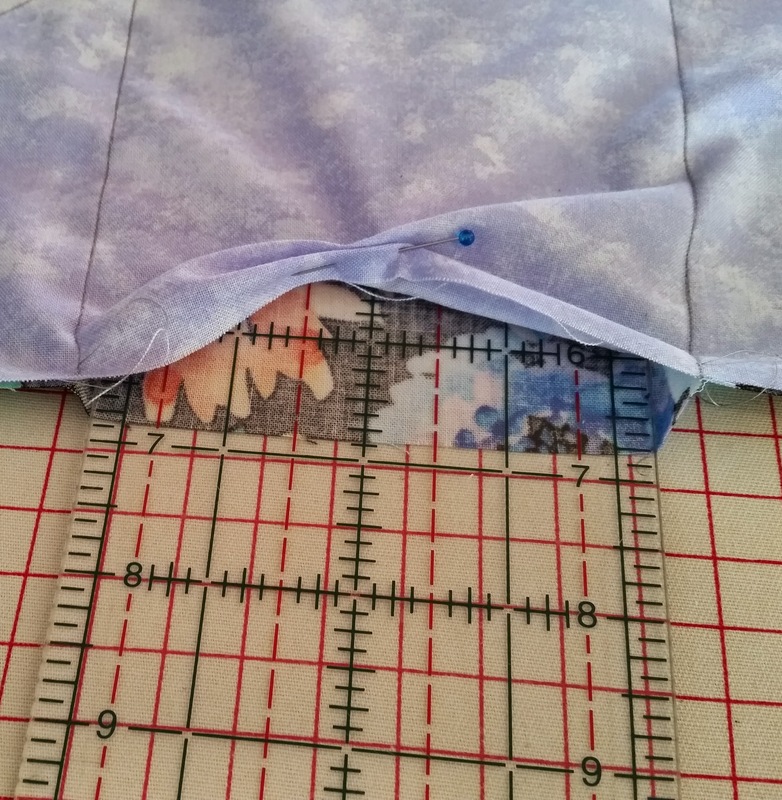 The pattern calls for covering the inside side seams with a binding. In an effort to save time and fabric, I serged those seams. It’s a grocery bag, not an evening one. Lastly, I did not put binding on the top. I cut the fabric a little longer and folded it over and topstitched it down. I did press the fold and opened it before sewing the side seams. So far, the reviews have been great. My daughter took hers to the grocery store this afternoon and received a number of comments/compliments. I love hearing about those. Before you start thinking that I really have it together because I’m making Christmas presents in May, know that these originally were supposed to be given out in 2012. Unfortunately, I sustained an injury with a sewing machine needle that required a trip to the ER while finishing a set of these and the project got put away until……..well now. The pattern is called “Pot Handlers: Potholders & Oven Mitts with Personality” by Tiger Lily Press. Super simple to put together. The only change I made was to leave the hanging loop flat on the back. The holders themselves still hang nicely if one wants, but you can also use them as a mini trivet. I came up with a nice little trick for the binding. I left just enough of a tail at the beginning to fold the binding at a 45⁰ angle. Then I put on a very light line of Liquid Stitch™ using a toothpick. 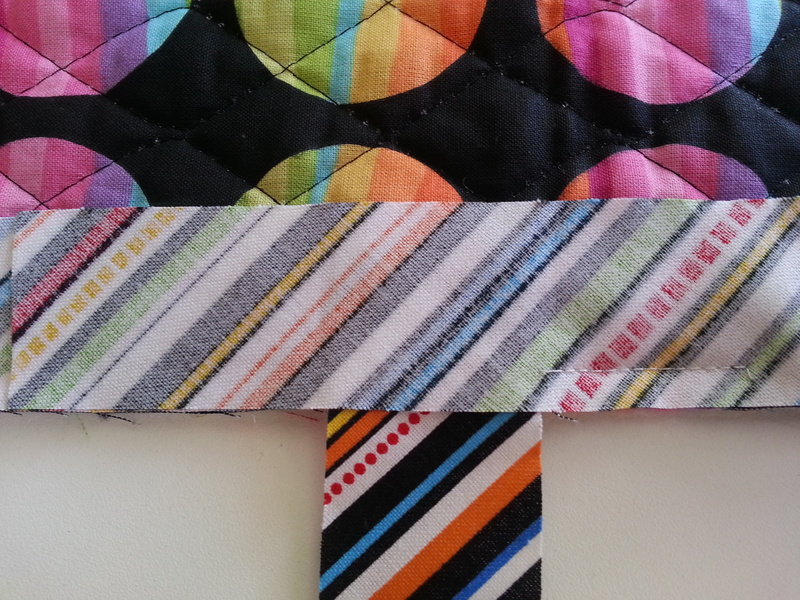 I laid the ending strip of binding across and finger smushed it together. I let dry for 30+ minutes. At this time, I could trim the seam allowance and then sew the binding down. I think this is a great technique for joining the ends of binding on smaller items and will definitely keep this in my toolbox of tricks. 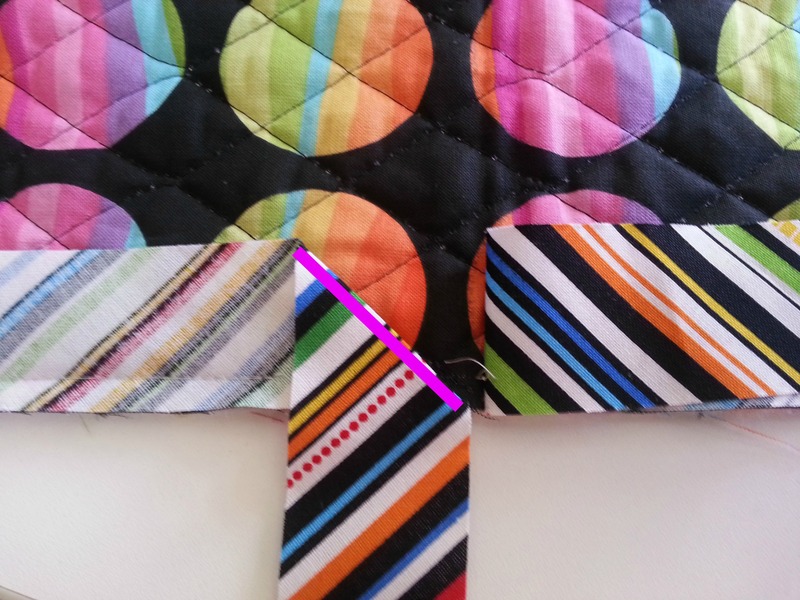 Place Liquid Stitch™ on the pink line. 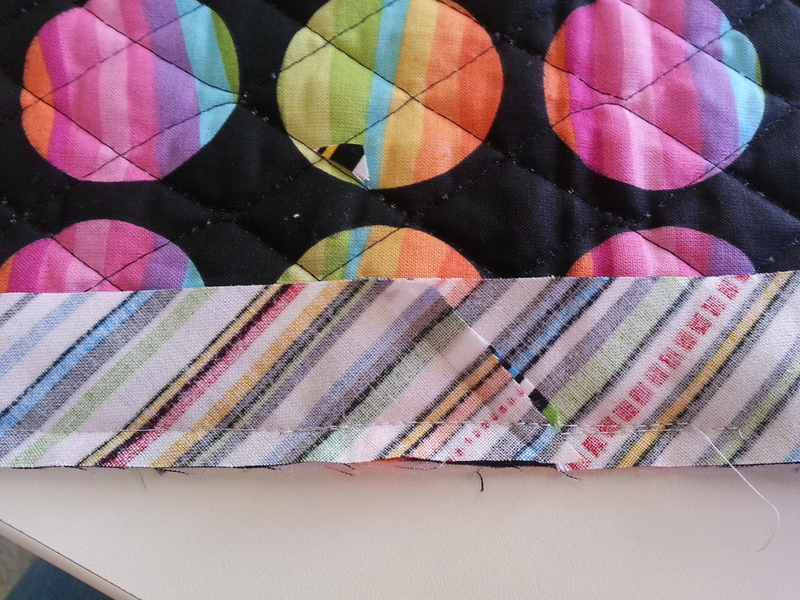 Overlap the binding and smush down. When dry, trim and stitch down. Lesson Learned: I bought this holiday fabric thinking it would be great for this project. Some of it was; like the little cups of cocoa. The Snowmen and Santas…not so much. You can’t tell what they are on most of my pot holders. The next time I make these, or anything this small, I will think differently when I purchase my material. The rick rack was actually used to cover up a slit in the fabric. I fixed the slit with Liquid Stitch™ and then covered it with the rick rack. No matter what the mistake, it can always be salvaged one way or another. 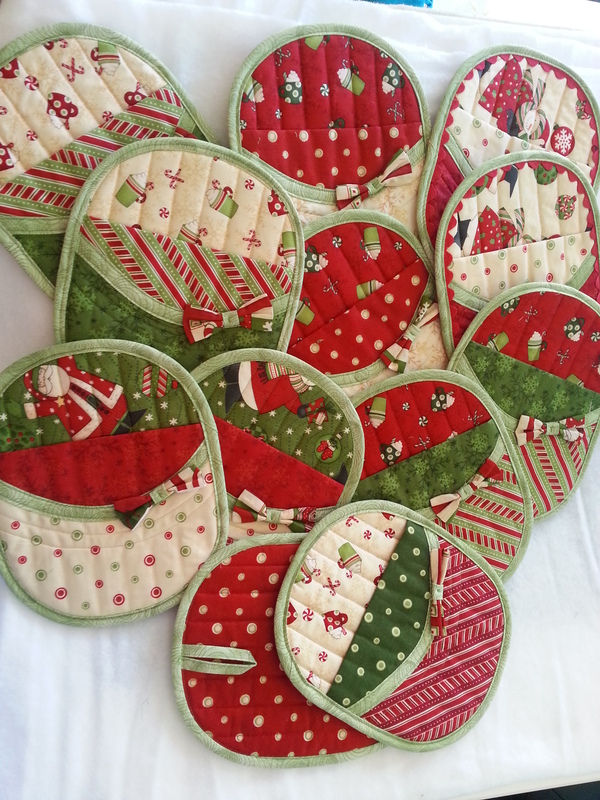 I hope these pot holders inspire you to start thinking about your holiday sewing plans. 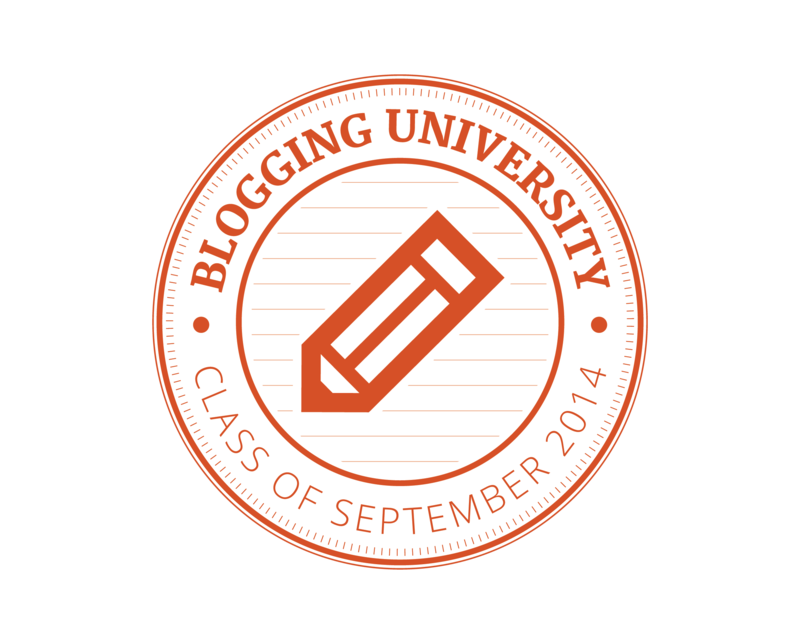 This entry was posted on June 3, 2014, in Quilting, Tips and other useful info and tagged Binding, Gift ideas.